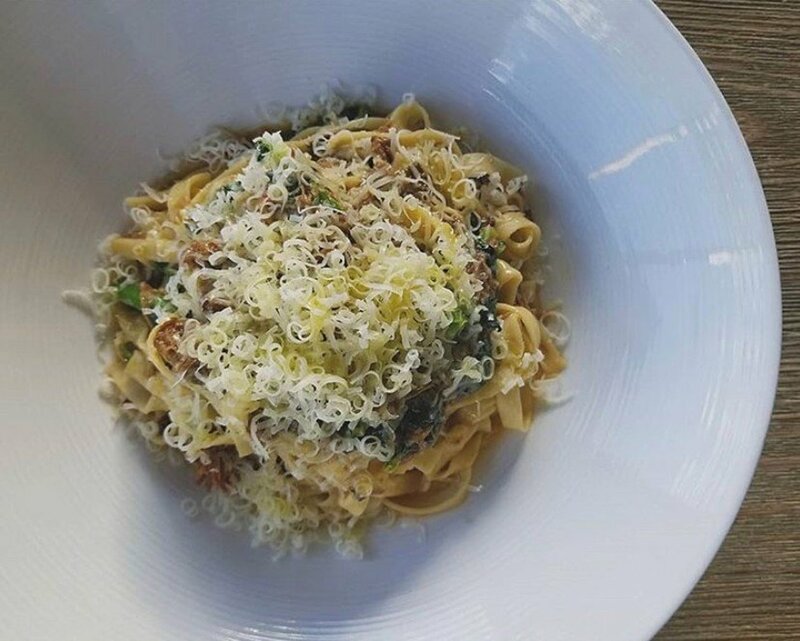 Tagliatelle pasta is tossed with tender lamb shoulder, broccoli rabe, rosemary, pepper flakes, asiago cheese and good quality extra virgin olive oil for a simple, yet hearty dish. Season the lamb and sear in oil in a large rondeau. Remove and set aside. In the same pan, add the onion, celery, carrots and garlic and cook until vegetables are browned. Add the tomato paste and cook 5 minutes more. Deglaze with white wine and add the brown sugar. Add the rosemary. Return the lamb to the pan, add enough prepared Knorr® Liquid Concentrated Base Chicken to cover and bring to a simmer. Cover and braise in a 325F oven for about 3.5 hours until the lamb is fork tender. Shred the lamb. Strain the vegetables from the liquid, and add enough liquid back to the shredded lamb to coat. For each portion, heat 2 Tbsp butter in a sauté pan, add 1 thinly sliced garlic clove and crushed red pepper flakes. Sauté ½ cup broccoli rabe. Add cooked pasta and lamb to heat through. Place in a bowl, shred ¼ cup asiago over top and drizzle with extra virgin olive oil.